In the music business, being innovative and influential does not necessarily translate to commercial success. It was once said about The Velvet Underground (by whom isn't clear – the quote is attributed to several different people depending on where you read it) that they only sold about 10,000 copies of their debut album (again, the number varies depending on where you read the quote), but that every one of those people who bought the album went out and started a band. You could probably make a similar argument for Los Angeles based funk/punk band Fishbone, who may have sold a few more records than that, but nonetheless found true mainstream success elusive. 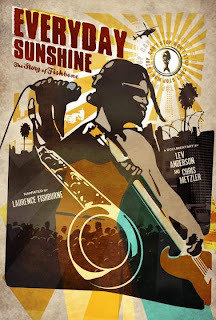 In their documentary EVERYDAY SUNSHINE: THE STORY OF FISHBONE, co-directors Lev Anderson and Chris Metzler detail how the band came together and forged their unique sound, eventually signing a deal with Columbia Records despite the label not really knowing what to do with them or how they should be marketed. They were perceived as “black” music due to their race, but as George Clinton says in the film, they were “too white for black people and too black for white people.” Whatever advances may have been made towards racial equality in the eighties, the fact remains that at the time, black artists weren't supposed to play rock music. Fishbone didn't care. They played what they wanted to play, and in doing so became one of the bands to help lay the groundwork for the “alternative” rock movement of the early nineties. The band had plenty of internal obstacles to overcome as well. Founded by bass player John Norwood Fisher and his brother Phillip “Fish” Fisher on drums, the band eventually became a six piece with each member bringing in varying influences, notably guitarist Kendall Jones' affinity for hard rock and frontman Angelo Moore's general insanity. Despite everyone pulling in different directions, the band was determined to be a democracy, resulting in an extremely eclectic sound. Somehow the group managed to stay together from 1979 until 1994, when a bizarre twist saw the departure of Jones right when the band was at its commercial peak. After that, more traditional “artistic differences” saw several other founding members leave, each of whom is given a chance to explain their reasons in the film. As we see, John Fishman and Moore continue to soldier on with new recruits, but seeing them reduced to playing in front of a handful of bored Europeans on plastic lawn chairs feels like that scene in THIS IS SPINAL TAP where the fictitious heavy metal band gets second billing to a puppet show. As the various original members reconnect for the filming of the documentary, there's a glimmer of hope that maybe past glories can be recaptured, but you'll just have to watch for yourself (or cheat and look it up on Wikipedia) to find out what happens. Fishbone is certainly a band worthy of such a career appraisal, and Anderson and Metzler do a pretty good job of telling their story. As far as rock docs go, this one is somewhat above average, mostly due to the unique personalities of its subjects (especially Moore) and the obvious love the directors have for the band. I don't foresee it will bring too many new fans into the fold, but for those who already know and love Fishbone, it's a fine documentation of the group's rocky career. 3 out of 4 stars.